Fig. 1: A problem from the first ever algebra textbook. The first ever algebra text book was written in Baghdad around 830CE, by the Persian mathematician Muhammad ibn Musa al-Khwarizmi, our modern word “algebra” coming from the Arabic term al-Jabr, a technique for balancing an equation, described in the book. 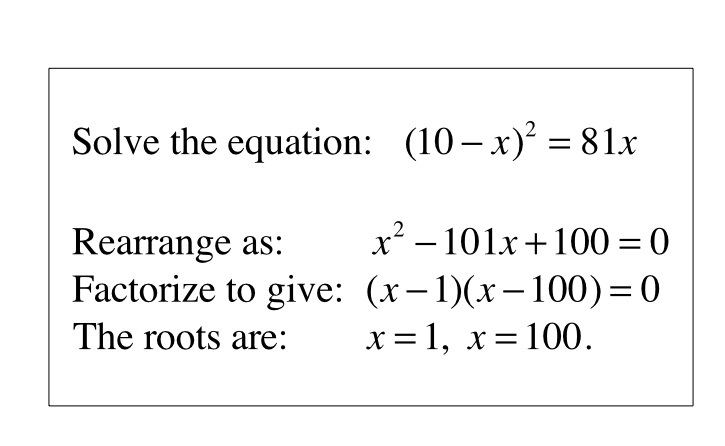 If you were a student – or a teacher – back then, the problem shown above (Figure 1) is the kind of thing you would be faced with in your math class. It is a direct translation from the original Arabic of a problem in al-Khwarizmi’s book. Most modern readers, on seeing this for the first time and being told it is an algebra problem, are surprised that there are no symbols. Yet it is clearly not an “algebra word problem” in the usual sense. It’s just about numbers. It is, in fact, a quadratic equation problem. Figure 2 below is the same problem as we would present it in an algebra textbook today. Fig. 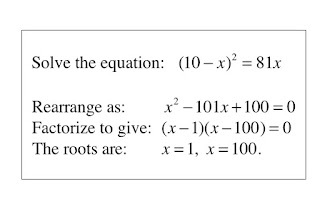 2: Al-Khwarizmi's quadratic equation in modern notation. 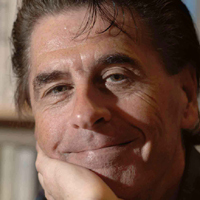 Symbolic algebra, as we understand it today, was not introduced until the Sixteenth Century, when the French mathematician François Viète took what until then had been a discipline presented in prose, and turned it into the symbolic process we are familiar with today. This is not to say that mathematicians back in Ninth Century Persia did not use symbolic expressions in their work. They surely did. The issue is how they presented it in textbook form. In the days when books were handwritten and duplicated by hand-copying, the author of a mathematics book was faced with a problem that other writers did not have to worry about: faithful copying. Copying of manuscripts was largely done by monks in monasteries. While masters of the written word – they did, after all, “live by a book” — few monks mastered mathematics, and hence could not be relied upon to create an accurate copy of anything other than prose. Aware of this issue, authors of mathematics books wrote everything in prose. Notice, however, that the two presentations of the quadratic problem specify the same problem, and both solutions are, from a logical deduction point of view, the same. To some extent, the al-Khwarizmi’s prose version describes what goes on in your head when you solve the problem. At least — and this is where I am going with this — it does if you solve the problem by thinking about it. 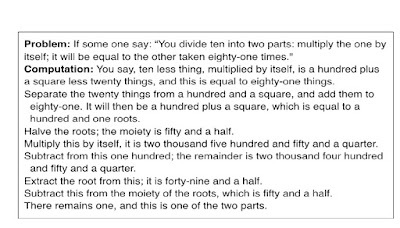 While the student in Ninth Century Baghdad solved (linear and quadratic) equations by performing essentially the same steps as a student would today, with the problem presented in words, and the solution written out (presumably) in words, it can’t be carried out in a mindless fashion. The human mind can learn to follow rules for manipulating symbols, without knowing what they mean, but words are so much an integral part of human thinking that we cannot use them without their having meaning (albeit possibly a meaning other than the one intended by the author of an algebra book). This was cutting edge stuff back then. It doesn’t get much more practical than that! As al-Khwarizmi explains, he was asked to write his book by the Caliph, who recognized the importance — for trade and engineering in particular (both of which were crucial to the regional society at the time) — of making those new methods of calculation widely available. The Caliph’s reasoning was as sound and significant then as it would be today. When a society reaches a state of development where trade and commercial and financial activity go beyond two people engaging in one-off transactions, it needs a more efficient tool than basic arithmetic. What is required is arithmetic-at-scale. When you boil it down to its essence, that is what algebra is. Al-Khwarizmi’s book codifies and formalizes the numerical reasoning that people use in their daily personal and professional lives in a fashion that enables them to operate at scale. In the years since the printing press made it possible to produce algebra textbooks that used symbolic representations, the focus in the algebra class has gradually shifted from being about sophisticated reasoning about numbers to an often mindless game of symbol manipulation. 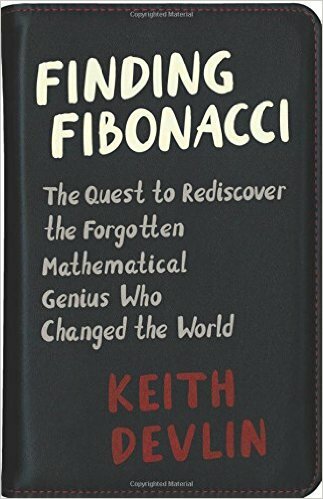 For several centuries that could be justified on the grounds that the only effective way for society to be able to handle the arithmetic-at-scale required to advance was to train lots of people to carry out the necessary calculations. And for that, the most efficient way is to use rule-based, symbolic manipulation. The people carrying out those calculations no more had to understand what they were doing than the electronic calculator on your iPhone has to understand what it is doing. All that matters it that it – the human symbolic-algebraist or the calculator app — gets the right answer. But now that those of us in more advanced societies (and in a great many less advanced societies, for that matter) do have ready access to those powerful calculating devices, devices that in addition to performing numerical calculations can also solve algebraic problems (arithmetic-at-scale, aka the electronic spreadsheet), the once-important societal need for many human symbolic calculators has gone away. What is required today is that people can make effective use of those new tools. That has shifted the emphasis back from symbolic-rule-mastery to the kind of formalized, rigorous thinking about quantitative matters that, thanks to al-Khwarizmi, we call algebra. Only now, we are back to the realm, not of symbol manipulation, but codified, logical, rigorous thinking about issues in our lives and in the world we inhabit. To be sure, symbolic algebra is not going away. It is way too powerful to ignore. But whereas it used to be possible to provide a rationale for teaching algebra as pure, rule-based symbolic manipulation (albeit a societal rationale that views people as fodder for industry), it makes no sense to teach it that way today. Which is why the Common Core now directs the focus not on the symbolic rules that dominated math instruction for centuries past, but on sophisticated mathematical thinking skills that develop and require a deeper understanding of numbers. This is why there is now so much talk of “number sense” and why Mary and Johnny are coming home from school with homework questions that their parents often find strange and occasionally incomprehensible. In Part 2 of this commentary, to be published here next month, I will look at how those same digital technologies that have rendered obsolete much of what used to constitute K-12 algebra education, have provided new ways to teach the subject that are ideally suited to the way we use — and will increasingly use even more — algebra. 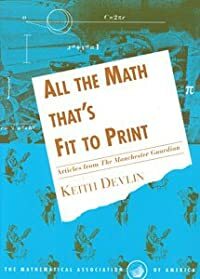 After all, if the printing press turned algebra from prose to symbolic expressions, what will algebra look like now that the digital computer, and in particular the tablet device, has largely replaced the printing press? NOTE: I realize that there is little in this month’s post that is new to MAA members. But as I know from emails and comments I receive, Devlin’s Angle posts find their way to a wide variety of readers, occasionally onto the desks of governors, education administrators, and others who play a role in the nation’s education system. With so much media attention currently being given to a mathematics education proposal being made by an individual having little knowledge of mathematics or current mathematics education (see last month’s column), I thought it timely to bring us back to an appreciation of algebra (i.e., algebraic thinking) that was apparent to a Ninth Century Caliph in Baghdad, and which is even more relevant to our lives today than it was back then. I cannot avoid ending by observing that 2016 will surely go down as the year when the US media devoted more media space and time to individuals pontificating on topics they knew almost nothing about, than they did to experts, of which the United States has large numbers with global reputations. 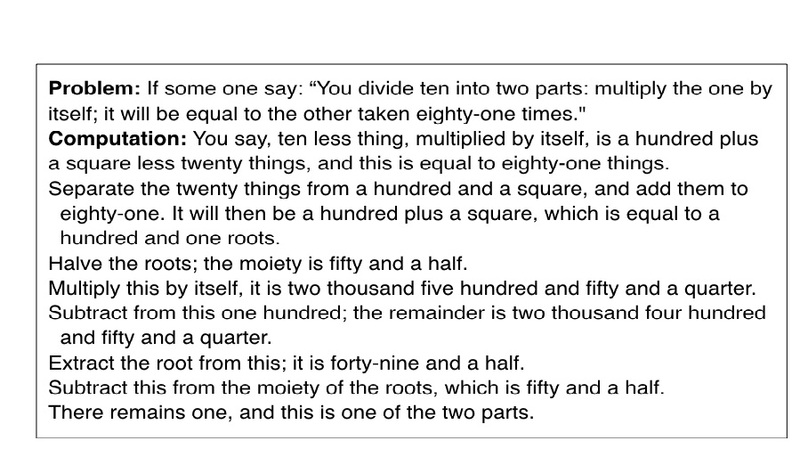 I think many editors would benefit from a (good) course in algebraic thinking.